Speciality: Vayalur village is surrounded by green paddy fields and rich green foliage of coconut groves. Main temple is facing east and the main entrance into this graceful Temple is through a gateway of Rajagopuram directly leading into the inner temple precincts. The majestic Rajagopuram is consisting of five Anganams. In front of the temple, on Southeast side there is a holy bathing tank known as Sakthi Theertham (Agni Theertham). Legend says that Lord Muruga Himself had created this tank by using His Velayutham. 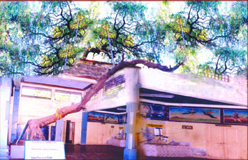 Entering into the temple one can see the Sthalavirksham "Vanni Tree" and in the specious prakara mandapam, puranic pictures depicting Kandapuranam can be seen. 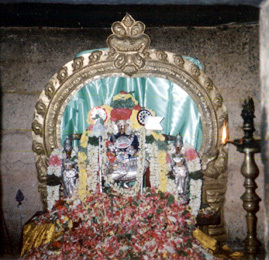 Proceeding further one finds the shrine of Lord Ganesa, Dwajasthambam, Balipeedam and the statue of Nandhi facing towards sanctum sanctorium of Lord Athinathar(Sivalingam), the presiding diety and in another temple, Goddess Athinayaki facing southside. Lord Subramaniya swamy shrine is on the backside of the Siva's shrine. He is giving darshan with His two consorts, Sri Valli and Deivayanai. All are in a standing position. Beside Them Their vahanam Peacock is facing left side looking Sri Deivayanai. It is called Devendra mayil. It is a rare sculpture. Daily poojas are commenced only after Lord Muruga worshipped His parants (Athinathar and Athinayaki). That is why; Lord Siva is also called as KumaraPoojithanathar. He is also praised by the names of Vidanga peruman, Mahadevar and Agneeswarar. Particular mention has to be made here about Navagrahas, which are in the northeast corner of the temple. While the shrine Suriya with his two consorts (Devies) Ushadevi and Sayadevi are in standing position, all other eight grahas are in standing position facing towards Surya. It is believed that all dhoshas (misfortunes) caused by these grahas are being wiped out by the blessings of Lord Surya as well as by Lord Muruga. 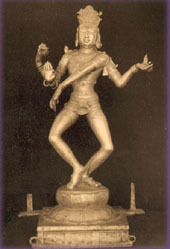 The Chathura Thandava posture of Lord Nataraja is worth seeing. Thiruvasi and Muyalagan (dwarf-demon) at His feet are not found. Very rare idol.